Goolboshra, a housewife and a widow, is 35. Kandahar— I live in a village in the Kandahar Province. I was once married and today is my wedding anniversary, but my husband was murdered many years ago. We had one child. In our village, for our human rights we have clergies, elders, and wise persons like the village chief. But then from the radio we hear about the Human Rights Commission. Our men do not tell us about this. We have heard how the Human Rights Commission helps when someone’s life is involved with danger and violence. 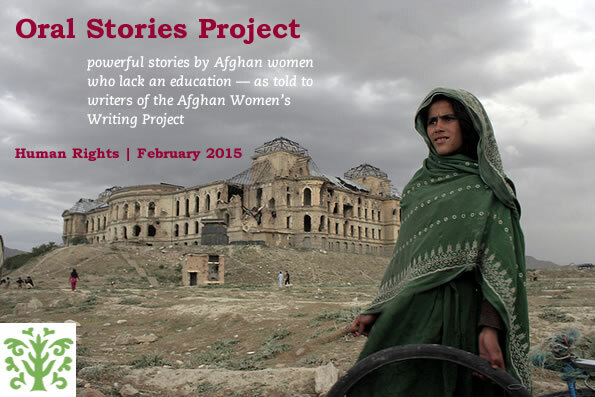 In Afghanistan, women’s rights, especially in rural areas and villages, are in their hands. A woman’s life is so violent. We say to them, there are women who work in offices and work in different jobs. Some of them are doctors and they save the people’s life. I ask the Human Rights Commission to pay attention to rural districts and villages where there is bad behavior with women, so women can gain their rights. From government I ask them to send information to our homes by television and radio. In our village there are no educated persons. We have many problems—they should announce that men and women are equal. You came to us to give us this chance, to ask and answer and to find what is in our hearts. Our hearts are full of what? They are full of pain and labor. You can collect our ideas and you can raise our voice. Give our young sons and daughters a chance and an opportunity to work. Thank you for writing this, Fatima. I hope that Goolsboshra knows that her story is now published and can be read and heard around the world. Change takes time, but it can happen! Meanwhile I hope that you continue to write down women’s stories and publish them! Our humanity can only grow if such lives are written about with creativity and compassion. I hope that other women and men in Afghanistan read this story as well and work to make all women’s lives better. Goolsboshra, Thank you for sharing the story of your life and your wishes. It is so important to hear from women like you in villages and rural areas. I share your dream that women in Afghanistan will someday be treated equally and be able to live without fear of violence. I hope the Human Rights Commission pays attention to your requests. I wish for you and your family a better life.